Karl Marx was a German political philosopher and revolutionist, co-founder with Friedrich Engels of scientific socialism (modern communism), and, as such, one of the most influential thinkers of all times who has seriously disrupted the course of economics itself. Marx was born in Trier on May 5, 1818, and educated at the universities of Bonn, Berlin, and Jena. In 1842, shortly after contributing his first article to the Cologne newspaper Rheinische Zeitung, Marx became editor of the paper. Although his political views were radical he was not yet a communist. His writings in the Rheinische Zeitung criticizing contemporary political and social conditions embroiled him in controversy with the authorities, and in 1843 Marx was compelled to resign his editori al post, and soon afterward the Rheinische Zeitung was forced to discontinue publication. Marx then went to Paris. There, as a result of his further studies in philosophy, history, and political science, he adopted communist beliefs. In 1844, when En gels visited him in Paris, the two men found that they had independently arrived at identical views on the nature of revolutionary problems. They undertook to collaborate in a systematic elucidation of the theoretical principles of communism and in t he organization of an international working-class movement dedicated to those principles. For information on their collaboration, which continued until Marx’s death, see Engels, Friedrich. In 1845 Marx was ordered to leave Paris because of his revolutionary activities. He settled in Brussels and began the work of organizing and directing a network of revolutionary groups, called Communist Correspondence Committees, in a number of European cities. In connection with the consolidation of these committees in 1847 to form the Communist League, Marx and Engels were commissioned to formulate a statement of principles. The program they submitted, known throughout the world as the Communist Manifesto, was the first systematic statement of modern socialist doctrine and was written by Marx, partly on the basis of a draft prepared by Engels. The central propositions of the Manifesto, contributed by Marx, embody the theory, later explicitly formulated in his Critique of Political Economy (1859), called the materialist conception of history, or historical materialism. These propositions are that in every historical epoch the prevailing economic system by which the necessities of life are produced determines the form of societal organization and the political and intellectual history of the epoch; and that the history of society is a history of struggles between exploiting and exploited, that is, between ruling and oppressed, social classes. From these premises, Marx drew the conclusion in the Manifesto that the capitalist class would be overthrown and that it would be eliminated by a worldwide working-class revolution and replaced by a classless society. The Manifesto influ enced all subsequent communist literature and revolutionary thought generally; it has been translated into many languages and published in hundreds of millions of copies. After the Manifesto appeared, revolutions occurred in France and Germany, and the Belgian government, fearful that the revolutionary tide would engulf Belgium, banished Marx. He thereupon went first to Paris and then to the Rhineland. In Cologne he established and edited a communist periodical, the Neue Rheinische Zeitung, and engaged in organizing activities. In 1849 Marx was arrested and tried in Cologne on a charge of incitement to armed insurrection; he was acquitted but was expelled from Gerrmany, and the Neue Rheinische Zeitung was suppressed. Later in the same year he was again banished from France; he spent the remainder of his life in London. In England Marx devoted himself to study and writing and to efforts to build an international communist movement. During this period he wrote a number of works that are regarded as classics of communist theory. These include his greatest work, Das Kapital (vol. 1, 1867; vol. 2 and 3, edited by Engels and pub. posthumously in 1885 and 1894, respectively; trans. 1907-09), a systematic and historical analysis of the economy of the capitalist system of society, in which he developed the theory of th e exploitation of the working class by the capitalist class through the appropriation by the latter of the “surplus value” produced by the former. See Capital. Marx’s next work, The Civil War in France (1871), analyzed the experience of the short-lived revolutionary government established in Paris during the Franco-German War (see Commune of Paris, 1871). 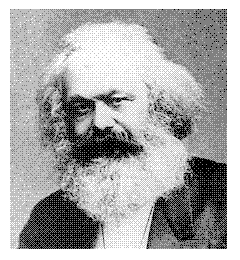 In this work Marx interpreted the formation and exis tence of the Commune as a historical confirmation of his theory of the necessity for workers to seize political power by armed insurrection and then to destroy the capitalist state; he hailed the Commune as “the finally discovered political form under which the economic emancipation of labor could take place.” This theory was explicitly projected in The Gotha Program (1875; trans. 1922): “Between the capitalist and communist systems of society lies the period of the revolutionary transformation of the one into the other. This corresponds to a political transition period, whose state can be nothing else but the revolutionary dictatorship of the proletariat.” During his residence in England Marx also contributed articles on contemporary political and social events to newspapers in Europe and the United States. He was a correspondent of the New York Tribune, edited by Horace Greeley, from 1852 to 1861, and in 1857 and 1858 he wrote a number of articles for the New American Cyclopedia, edi ted jointly by the American writer and editor Charles Anderson Dana (1819-97) and George Ripley (1802-80). When the Communist League dissolved in 1852, Marx maintained contact and corresponded with hundreds of revolutionists with the aim of forming another revolutionary organization. These efforts and those of his many collaborators culminated in 1864 in the establishment in London of the First International. Marx made the inaugural address, wrote the statutes of the International, and subsequently directed the work of its general council or governing body. After the suppression of the Commune, in which members of the First International participated, the International declined, and Marx recommended the removal of its headquarters to the US. The last eight years of his life were marked by an incessant struggle with physical ailments that impede d his political and literary labors. Manuscripts and notes found after his death in London on March 14, 1883, revealed that he had projected a fourth volume of Das Kapital to comprise a history of economic doctrines; these fragments were edited by th e German socialist Karl Johann Kautsky and published under the title Theories of Surplus Value (4 vol., 1905-10; trans. 1952). Other works planned and not executed by Marx included mathematical studies, studies embodying applications of mathematics t o economic problems, and studies on the historical aspects of various technological developments. Marx’s influence during his life was not great. After his death it increased with the growth of the labor movement. Marx’s ideas and theories came to be known as Marxism, or scientific socialism, which constitutes one of the principal currents of contemporary political thought. His analysis of capitalist economy and his theories of historical materialism, the class struggle, and surplus value have become the basis of modern socialist doctrine. Of decisive importance with respect to revolutionary action are his theories on the nature of the capitalist state, the road to power, and the dictatorship of the proletariat. These doctrines, revised by most socialists after his death, were revived in the 20th century by Lenin and, as developed and a pplied by him, constituted the core of the theory and practice of bolshevism and the Third International.